Ed is 81-years-old and is doggedly resilient. In 1939, a few years after he was born, he contracted polio. It didn’t stop him. When the polio vaccine came out in the 1950s, Ed was there. Despite a cane and a limp, he went on to have a successful career in remodeling and as a licensed electrician. About 10 years ago, when Ed was in his 70s, he and his wife built their own home – literally from the ground up. “It helps that your brother is a roofing contractor and that you know your way around electricity,” he jokes. Ed has never backed down from a challenge life threw at him. So when he realized he was suddenly staring down hunger, he wasn’t going to give up. 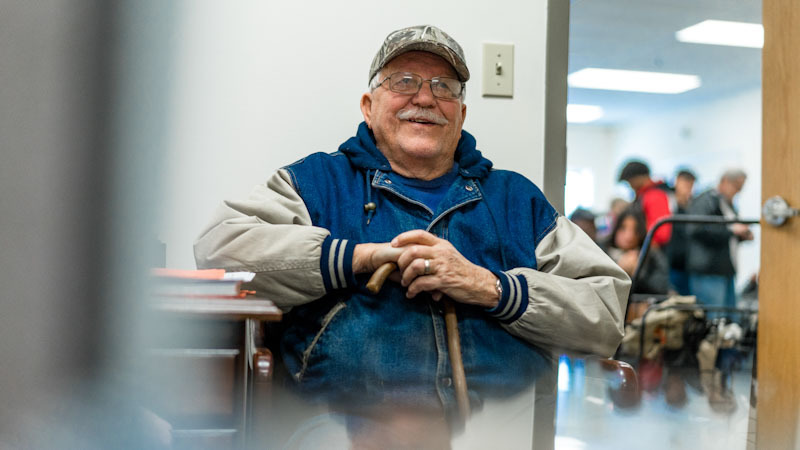 Now retired, Ed and his wife are living on a fixed income that keeps their budget tight. This winter, the colder weather has meant higher bills – and the couple hasn’t had much money left over for food. So they started visiting a local food pantry. Still, the couple isn’t deterred from being happy and trying to make the most of every day. “Our budget is especially stretched in the winter, but we’re resilient. And that’s the best way to be,” Ed said.